The people have spoken. Nobody likes the new Cy-Hawk trophy. Rather than be negative, I am going to be a true Iowan and propose a solution. 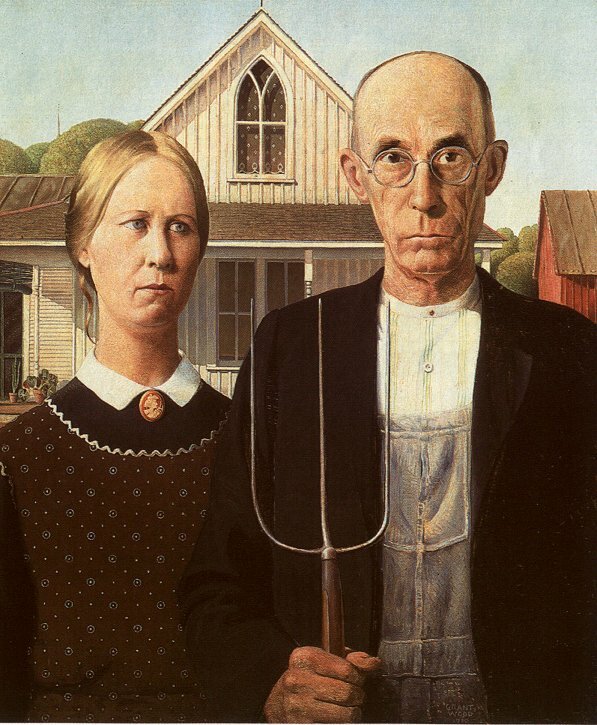 The Cy-Hawk trophy should be Grant’s Pitchfork, from Grant Wood’s famed “American Gothic”. Grant’s Pitchfork is perhaps the most enduring image associated with Iowa. It’s instantly recognizable. The Pitchfork symbolizes the connection between Iowans and the land, and the value of hard work. The Pitchfork is not a glamorous tool. It’s not high tech, but it gets the job done, a characteristic to which Iowans can relate, not only of themselves but their football programs. The Pitchfork is cool. It is not out of place on a football field. Imagine the victors hoisting the Pitchfork in the air at the 50-yard line at Kinnick, or at Jack Trice. It has the physical dimensions of a prize. The Pitchfork is whimsical, just like American Gothic itself. This is an underrated quality in a football trophy. The trophy needs to be whimsical in order to draw some attention away from itself (and its sponsor) and to the real prize – the pride associated with beating a rival. It also calls attention to the fact that this, after all, a game. There is a basic problem with replacing a trophy, and that is that new things lack history. The Little Brown Jug, the Apple Cup, Floyd of Rosedale mean something because, well, they mean something. Playing for Grant’s Pitchfork solves this problem because the object itself has a timeless quality which has its own history. This heritage can immediately be joined with the long history of the Cy-Hawk series, that is to say of Iowa dominating Iowa State. It would be foolish to ignore the fact that the trophy has been changed because of a new sponsorship deal with the Iowa Corn Growers Association, the Iowa Corn Promotion Board, and Learfield. The Pitchfork has a strong association with farming but no direct association with corn, which may be of concern to the sponsors. This problem is easily solved: stick the pitchfork in a big bushel of honest-to-goodness real Iowa corn. Imagine the number of camera shots in the course of the game – not of a replica, but of the real deal. I have two more suggestions. The first is to add a metal band around the handle for each year’s winner: black if Iowa wins, Red if Iowa State wins. When we run out of room, remove the bands as with the Stanley Cup, and let the schools display them in a suitable place. The second is for the sponsors to initiate a scholarship for each school, giving a full ride to a native Iowan who wants to pursue an art major. Who knows, maybe the next Grant Wood is out there right now.